← Maybe Not So Dashing in Donna? Just today I discovered that the George Bush Presidential Library, located in my very own town of College Station, Texas, has opened a new exhibit. The Heart Truth Red Dress Collection and First Lady Red Dress Collection have been on display since October 1, 2010, and will continue through August 14, 2011. Twelve celebrity red dresses will be on display in addition to first ladies’ gowns collected from thirteen presidential libraries. This first lady red dress collection was first initiated by former First Lady and The Heart Truth Founding Ambassador Laura Bush. 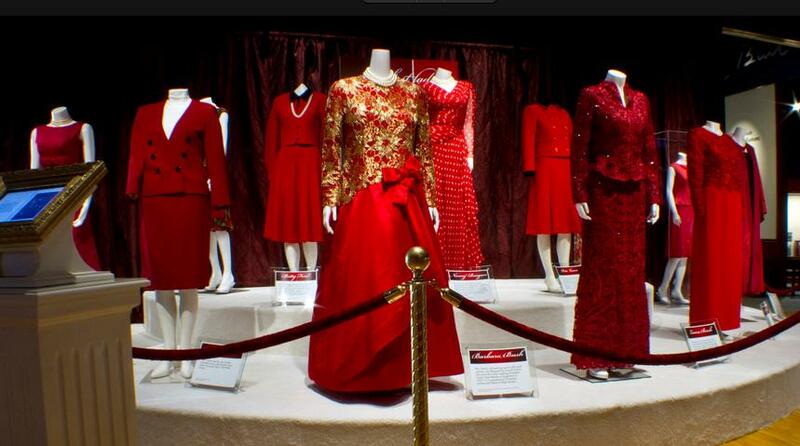 However, for this exhibit at the George Bush Presidential Library, the First Lady Red Dress Collection has been expanded to present some very special dresses, rarely seen by the public, including a Jacqueline Kennedy gown. The Heart Truth foundation was founded to give more information on heart disease, the single leading cause of death for American women. The red dress has now become a symbol of women’s awareness of this disease. I cannot wait to go check out this exhibit! Luckily for me, I can easily ride my bike to the George Bush Library. What do you think? Is The Heart Truth dress collection worth a trip to College Station for you? Click here to view a video for more information about this cause and exhibit.